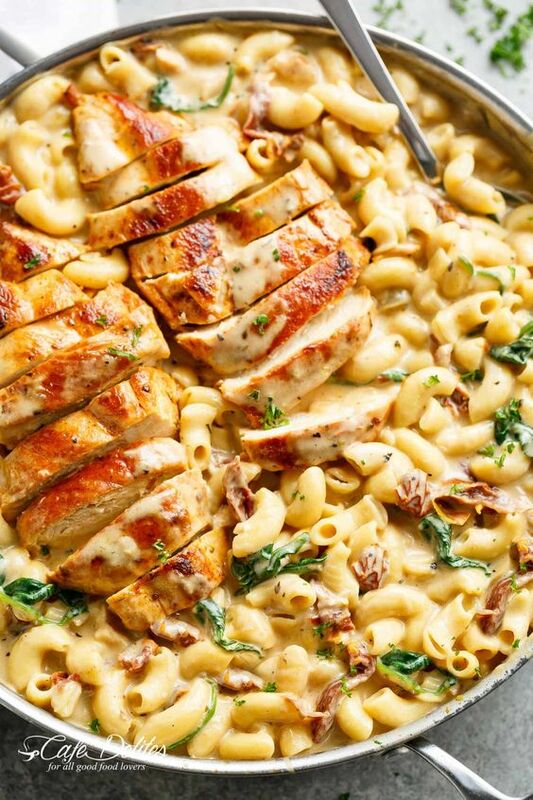 Tuscan Chicken Mac And Cheese is a ONE POT dinner made on the stove top, in less than 30 minutes! No extra pots or pans to wash up, and minimal work with simple ingredients! It will be hard to go back to regular Mac and Cheese after this! Season chicken with salt, pepper, paprika, dried parsley and 2 teaspoons of the oil. Heat the remaining oil in a large (30cm or 12-inch) pot or pan over medium-high heat. Add the chicken and sear on both sides until golden brown, cooked through and no longer pink in the middle. Transfer chicken to a warm plate, tent with foil and set aside. To the same pan, add the butter and fry the onion and garlic until the onion becomes transparent, stirring occasionally (about 2 minutes). Pour in the white wine and allow to simmer for 5 minutes, or until beginning to reduce down. Add the sun dried tomatoes with 2 tablespoons of the sun dried tomato oil from the jar and cook for 1-2 minutes to release as much flavour as possible. Stir the flour into the pot and allow to cook for a further minute. Then, add the broth, 2 1/2 cups of milks (or cream/half and half), herbs, salt and pepper, and bring to a very low simmer (lower the heat if you need to). Add the dry macaroni and stir occasionally as it comes to a simmer. Reduce heat down to medium low and stir regularly while it cooks (for about 9 - 10 minutes), or until the sauce thickens and the macaroni is just cooked (al dente: tender but still firm). Add the spinach and stir through until wilted. Take the pot off the stove and stir all of the cheese in quickly. Adjust salt and pepper to taste. If the sauce it too thick, add the remaining 1/2 cup milk (or cream) in 1/4 cup increments, until reaching desired thickness. Keep in mind the sauce will continue to thicken as it cools. Slice the chicken into strips and stir through the pasta (pour in any juices left from the chicken). Sprinkle with parsley, and stir through. Serve immediately!